Galveston residents and guests at the historic Hotel Galvez & Spa, A Wyndham Grand® Hotel, can explore the hotel’s storied past from the last 100 years at its new Hall of History exhibit which opens to the public on Friday, Jan. 14, 2011. The hotel, in collaboration with the Galveston County Historical Museum, will unveil this new Hall of History in the lower level of Hotel Galvez at 10 a.m. The unveiling is the first event in a series of monthly celebrations scheduled in 2011 as part of the hotel’s year-long centennial commemoration. The Hall of History will include panels about the history of the hotel and a visual slideshow of 200 images. The exhibit will feature various items displayed in two cases purchased from the original Eiband’s Department Store, which was formerly located at 2205 Post Office in Galveston. Many of these items were donated by former guests and hotel staff members from across the country, while others are part of the hotel’s collection. Those interested in donating items should contact the museum by calling (409) 766-2340 or emailing Curator Jennifer Marines at jennifer.marines@co.galveston.tx.us. Donated items are tax deductible. In conjunction with the Hall of History unveiling, the hotel will host an art competition exhibition on Jan. 14 from 11 a.m. to 2 p.m. and 5 p.m. to 7 p.m. and on Saturday, Jan. 15 and Sunday, Jan. 16 from 11 a.m. to 2 p.m., where submissions from area artists will be on display for public viewing. The hotel will select one art piece to be reproduced for Hotel Galvez’s centennial poster; additionally, the selected art piece will be auctioned off to benefit the Galveston Arts Center during the hotel’s centennial weekend celebration in June. The hotel is also selling a new commemorative book by Gary Cartwright entitled Hotel Galvez: Queen of the Gulf. The book sells for $39.95 and is available in the hotel’s gift shop and online. Hotel Galvez & Spa, A Wyndham Grand® Hotel and a National Trust Historic Hotel of America, remains the only historic beachfront hotel on the Texas Gulf Coast. Hotel Galvez is rated four diamonds by AAA and is part of Mitchell Historic Properties. Wyndham Hotels and Resorts, LLC, a subsidiary of Wyndham Worldwide Corporation (NYSE: WYN), offers upscale hotel and resort accommodations throughout the United States, Europe, China, Canada, Mexico and the Caribbean. All Wyndham® hotels are either franchised by the company or managed by Wyndham Hotel Management, Inc., one of its affiliates or through a joint-venture partner. For more information, visit www.wyndham.com. 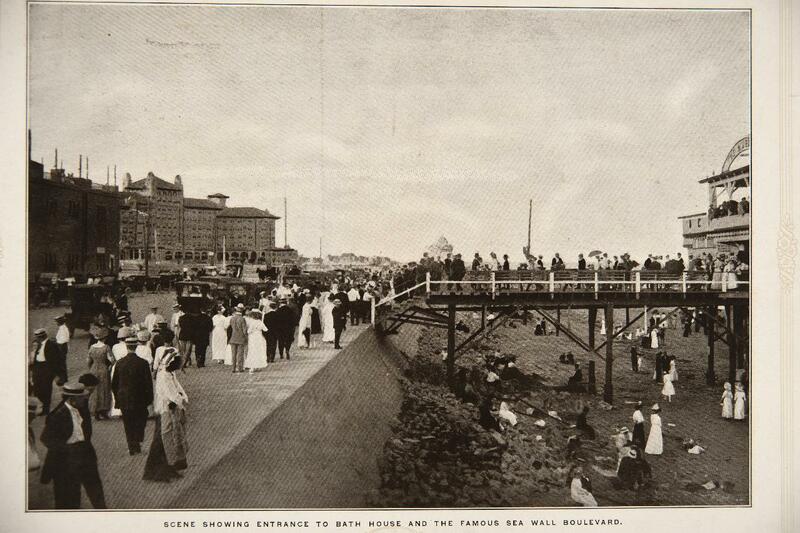 Caption reads, "Scene showing entrance to bath house and the famouse sea wall boulevard." Caption reads, "Scene showing entrance to bath house and the famouse sea wall bouvelard."